We can think of this as the function “how far away from the point 0 (the origin) on the real number line is x?”. It doesn’t care about what direction it is, only how far away it is. So the point 2 is a distance of 2 from the origin, and -2 is also a distance 2 from the origin. If the input is negative, return minus that number. The graph is twice as steep as the previous one (because of the 2 in ) and is defined separately for either side of . The solution is thus the union of these two solutions ie . Multiplying both sides by -1 changes the direction of the inequality to give: which can be solved to give: . But we know that this is only valid in the region (for this piece). So we have to take the intersection of the solution, with the region that it’s valid in. which can be solved to give: . 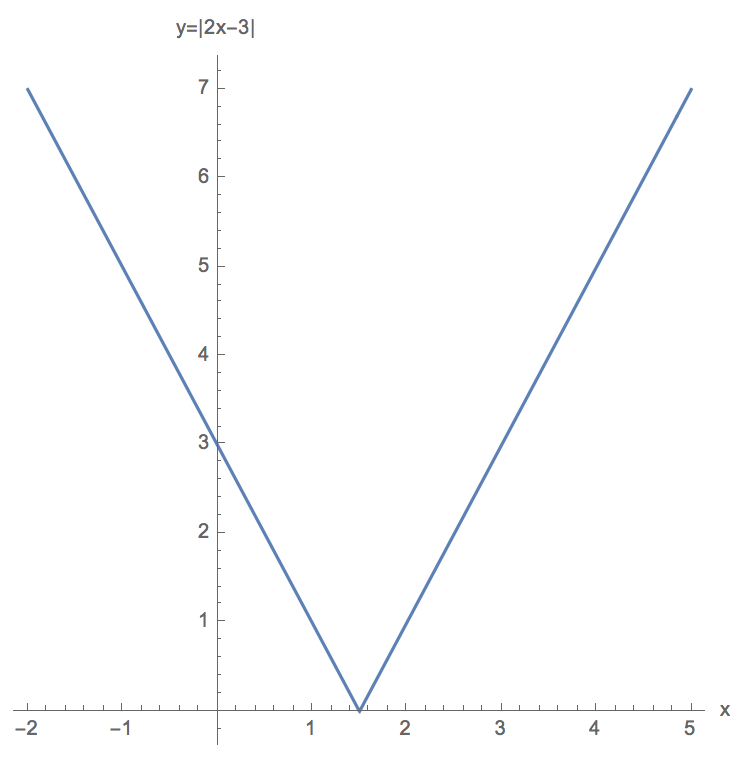 Looking at the above graph for the function and asking for what values of x is the y value greater than 4, the answer above seems to make sense. It’s true for any or for any value . OK, so this is how to calculate a very simple absolute value inequality, but now let’s look at something a little more complicated. Find all x such that . Now we have two absolute values to have to think about. I am going to give one method to think about this sort of problem, which is very general, but there are other methods. I recommend this as a failsafe one which will work in just about any context, with any number of absolute value functions. Let’s forget about the inequality for now and just focus on the left hand side. We can think of a function and eventually we will want to ask when this is less than zero. For now, let’s see if we can understand the function itself. This procedure can be done for absolute value inequalities with any complicated combination of functions. Let’s try one more example this time with a quadratic function inside an absolute value with an inequality. 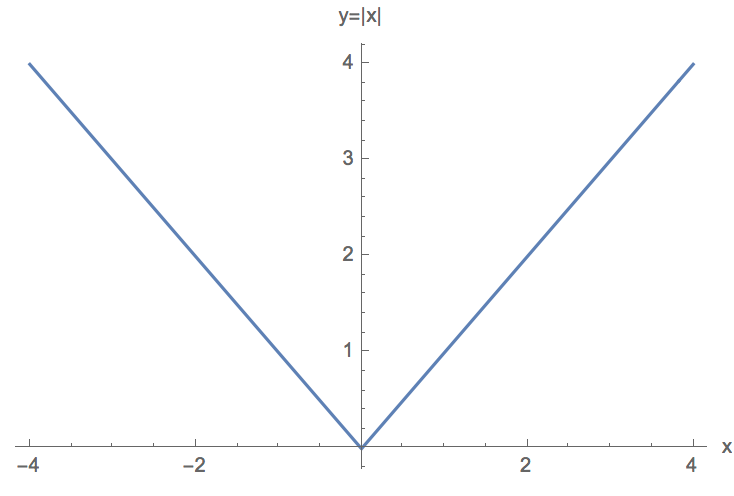 Now we have a quadratic function inside the absolute value sign. Let’s write everything on one side of the inequality and define a function . So the problem we want to solve is . We have to be a bit careful now with what the regions mean. In fact now we have to solve an inequality to understand what the regions correspond to. ok, good, now we have our three regions (it looks like two above, but really we can think of them as less than or equal to -1, from -1 to 3, greater than or equal to 3. Let’s look at the first inequality first. In the region (ie (-1,3)) we have the inequality . This is now a downward parabola. Finding the zeroes of gives us and . Because it is a downward parabola, the values of x for which the inequality holds (ie. the function is less than zero) is going to be . (plot the function to make sure that you understand this). If you are confused by a statement like this, write out a number line. ok, so we have the solution to the first region! Now let’s look at the second. In the region (ie ) we have the inequality . Solving this inequality in the same as we before we find the solutions or . and that’s it. That is the solution to the question: Find all for which . Again, there are most likely shorter ways of doing this, but we are able to use the same method in many different contexts and it should work every time.